Density: 16GB (2x8GB). - Speed: 1333MHz. - Low-profile design fits in smaller spaces. This item is not supplied with any addition accessories or cables. Best Quality. Money back. Mainland UK. 1 x Samsung 4GB 2Rx8 PC3 - 10600S - 09 - 11 - F3 (M471B5273DH0-CH9). Single module Laptop RAM, compatible with 204 pin SO-DIMM slots. The item is used but in fully working condition. It has the manufacturer's model number MT36JSZF51272PZ-1G4G1FE. This item has been removed from a working server. No testing has been carried out. HP Hynix 2GB 2Rx8 133MHz PC3-10600R. Rank: 2Rx8. Manufacturer: Hynix. Capacity: 2GB. HP Part Numbers: 501533-001 & 500202-061. FURTHER INFORMATION Intended for servers. Apacer 2GB 1Rx8 PC3 10600. Elpida 2GB 2Rx8 PC3 10600S. Hynix 2GB 1Rx8 PC3L 12800S. For example: you buy two modules and would like them to be Samsung, Hynix, or maybe PC3L. Manufacturer Hynix. Bus Clock 1333MHz. Capacity 4GB. Format DDR3. Revision / Version -. Other Information. Condition Used but Working. 1 x Samsung 4GB 2Rx8 PC3 - 10600S - 09 - 11 - F3 (M471B5273DH0-CH9)HP P/N: 536726-953. Single module Laptop RAM, compatible with 204 pin SO-DIMM slots. DDR3 - 1333 (PC3-10600). 4GB So-Dimm. Pulled From Working Machine due to upgrade . Type: 240 -Pin DDR3. Capacity: 8GB. HP Samsung 2GB 2Rx8 133MHz PC3-10600R. Capacity: 2GB. Manufacturer: Samsung. HP Part Numbers: 501533-001 & 500202-061. Double Sided : Yes. Model: M393B5673EH1-CH9Q10928. Speed: 133MHz. Each stick is 2GB in size. Bus Clock 1333MHz. Manufacturer Kingston. Capacity 2GB. Format DDR3. Revision / Version -. Pin/Connector Material Gold. Where Density matters you can be sure. Other Information. 1 x Hynix 4GB 2Rx8 PC3-10600S-9-10-F2. Form Factor 204 pin SODIMM. Manufacturer Hynix. Capacity 4GB. Format DDR3. The item is used but in fully working condition. Revision / Version -. Speed PC3-10600. Suitable for Apple Mac Pro A1289 2009 4.1 to 2012 5.1. Speed: DDR3 1333MHz (PC3-10600S). We will fill in the lower declared value on the parcel to avoid tariffs. If you encounter any trouble. Manufacturer Ramaxel. Bus Clock 1333MHz. Capacity 2GB. Format DDR3. Revision / Version -. Pin/Connector Material Gold. Where Density matters you can be sure. Other Information. Nanya (4GB) 2 x 2GB 1Rx8 PC3-10600S-9-10-B2 Laptop RAM. Removed from a good working Laptop. Will be packed in anti static materials. Dispatched with Royal Mail 1st Class. 2048MB (1x 2GB). It is not just the cost of the stamp. This is non-negotiable. Photo for reference only. OEM Part Number: 4GB DDR3 10600R 2RX4. Rank: 2RX4. Capacity: 4GB. All of our RAM sticks are tested before dispatch. A forklift is not required. We are aware that mistakes and problems can always occur but we will endeavour to get any issue resolved as quickly and fairly as possible. Various matched manufacturer ram will be supplied eg Hynix, Samsung, Micron, Nanya. We Also Record Serial Numbers. FULLY TESTED. Memory Speed - 1333MHz DDR3-10600/PC-10600 Memory Size - 4x 4GB DDR3 Form Factor - 240-pin DIMM 4x 4GB DDR3-1333 PC3-10600 240-Pin DIMM Brand QUMOX Bandwidth DDR3-1333 (PC3-10600) Feature Unbuffered, Non-ECC, Non-Registered Use for Desktop Type DDR3, DIMM Memory Type DDR3, DIMM Bus Speed PC3-10600 (DDR3-1333) Number of Modules 4 Capacity per Module 4 GB Capacity 4x 4 GB EAN 4895187102175 MPN Does not apply EAN 4895187102175 MPN Does not apply. Speed: PC3-10600R 1333MHz. Buffering/ECC: ECC Fully Buffered. Capacity: 4GB. DO NOT send without communication. Warranty only apply on the stated warranty period products. IMAC DETAILS. IMAC Identifier. Your iMac has four ram slots and the maximum upgrade is 32GB (4x8GB). INSIDE YOUR IMAC. CPU Model Number. Model Number. Release Date. 12 Month Warranty. Below is link that shows every compatible Xeon CPU, its details each CPU and its maximum supported ram size/speed. Your Mac Pro has 4 slots and the maximum possible upgrade is 56GB (3x16GB 1x8GB) or 64GB (4x16GB) depending on what CPU you have installed . Upgrading your computer's memory and performance is really simple with a variety of PC3-10600 DDR3-1333 computer memory RAM available. This important module in your computer system contains the stored information that runs programs effectively on your computer. The innovative capabilities of these modules mean that memory can be accessed at random rather than a sequence, which in turn runs the computer more efficiently. 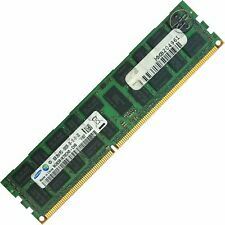 You can replace or upgrade this memory module with the range of computer RAM components available and this simple process will help you access increased performance and capabilities with your current PC. Find quality RAM components from ASUS, HP and Sony. There are a few simple steps to ensure that you choose the best memory module for your model of computer. There is a choice of memory sizes from 2GB to 16GB plus many others depending on your requirements. Selecting the correct component for your computer or laptop also depends on the configuration of your computer and its maximum memory capacity. The process of replacement or upgrade is quite simple and can make your computer system run more smoothly and efficiently. The selection of PC3-10600 DDR3-1333 computer RAM products offers something for a range of computer and laptop models, including both Windows and Apple systems. These specialist RAM modules are thoroughly tested to ensure quality and effectiveness. There is also a large variety of new, used and refurbished RAM components the give you an easy way to replace the memory and increase the performance of your computer in an affordable way. RAM memory modules are a great way to improve the responsiveness of your system. Memory upgrades help to handle larger data-intensive programs and offer your system an easy way to multitask for faster application loading time and smoother system use.